My most intimate experiences of J. S. Bach have been through his keyboard music, both as performer and teacher. Plumbing the depths of his non-organ keyboard output is a life-long occupation in itself; moving sideways to explore the church cantatas in any kind of depth would require another lifetime. In lieu of a full-scale immersion, I’m hoping to spend as much time as possible listening to them and reading about them and occasionally looking at some of the scores. Recently I created a small Spotify playlist of Bach Cantatas, and was surprised by how attractive and pleasant the music is. These cantatas represent a high point in the history of Protestant church music. On the face of it, many might consider them to be too high-brow or esoteric for the average modern-day listener. I was not expecting to be attracted to them for continued and repeated listening. Although certain movements from some cantatas have made it into the “popular” repertoire (e.g. wedding book arrangements of Jesu, Joy of Man’s Desiring and Sheep May Safely Graze), I rather expected them to be, on the whole, not much more exciting than the old LP recordings of Gregorian Chant I was required to listen to in my undergrad days. Chant can be beautiful, but it was never intended to please the listener; its purpose was to blend into the liturgy, and is best understood in that context, notwithstanding its fleeting popularity in 1990s chill rooms. For me, Bach’s cantatas are an entirely different matter. I don’t know if it’s the seemingly perfect blend of vocal and instrumental resources, the wide variety of expressive devices and textures, or the rhythmic vitality of many of the movements, but something about them keeps me listening. Like Gregorian Chant, the cantatas were designed for church services, not concert halls or private chambers. Unlike Gregorian Chant, the cantatas utilize the full spectrum of musical resources available at the time they were composed. They express a wide range of thoughts, feelings, and colors. They hold up well as pieces to be performed and listened to even outside of a church service. So if people begin to replace their taste for rock with classical music sometime around middle age, why is this a bad thing? Why is age 40 considered too late? Why are only young people in their 20s deemed a suitable subset of the population? Just because Madison Avenue covets that age group does not mean that symphony orchestras have to campaign for that same sector. The best musicians, in any style, know that to become better you have to practice, both alone and together. But understanding how music works helps any kind of musician serve the church more faithfully with their gifts. Someone who can read notes and play by ear has more tools to serve others. (Bob Kauflin, “Are We Responsible for Musical Literacy in the Church?” Worship Matters Blog, November 2, 2007). Ours will be a difficult task because music literacy in our surrounding culture is at an all-time low, even though we hear more music in our day-to-day existence than in any culture preceding ours. (Leonard Payton, “How Shall We Sing To God?” in The Coming Evangelical Crisis, ed. John Armstrong, Moody, 1996. pdf). Back in the Middle Ages (in a distant corner of the early 9th Century), some music-director-monk decided it would be a good idea to put little pictures of musical “notes” (neumes) above the Latin texts of the chants his choir-member-monks were singing, with the ostensible goal of helping them to learn and/or to remember the melody. (For an example of “[probably] the earliest example of Western neume notation that has survived,” see here). Perhaps some of the choir-monks were veering off the musical path a bit (to the deep consternation of the director-monk), or a tenor-monk was Complaining about staying up late for Compline, complicating the task of following the melismas in the Alleluia. For whatever reason, the practice of using musical notation began, having a huge impact on the development of western music. Although musical notation served the musical community well for a number of centuries, in our contemporary religious circles it has become a source of confusion, and apparently something to be avoided, at least for congregational use. A few outlier churches still use hymnals, but there is no doubt that the use of PowerPoint projection of lyrics (without any musical notation) has become the standard means for presenting music to the congregation. When it comes to encountering new songs, this situation is both irritating and frustrating to me (and from casual conversations I’ve had, it seems to be for many other people). There is nothing worse than being expected to sing a new song without having any clue about the musical notes and rhythms. On more than one occasion in more than one setting, I have heard suggestions that the best way for congregants to learn new songs is to look them up and listen to them on Youtube. The worship band will then provide the karaoke background tracks on Sunday morning, and everyone sings along (assuming they can hear themselves above the din and racket of the drums, bass, guitars, and keyboards). I think we can do better than Sunday Morning Karaoke Hour! In a slightly confusing series of articles, Tim Challies addresses the problem of abandoning a hymnal altogether (“What We Lost When We Lost Our Hymnals“), and then seemingly celebrates that fact (“What We Gained When We Lost Our Hymnals.”) I agree with many of the points from both articles, but neither article goes far enough in suggesting any solutions to a real problem. The implication is that there is a binary choice between using hymnals (with musical notation) or using PowerPoint (without musical notation). However, the choice is not a binary one. For example, it is possible to project notes along with lyrics on a big screen in front of people; it’s just that few churches seem to do it. It is possible to print notes along with lyrics for newer songs that are not in the hymnal; again, few churches actually do it. Although there are some restrictions, the CCLI license actually allows churches to present songs in a variety of ways to help congregations learn and sing new songs (see the CCLI Copyright License Manual). Although listening to new songs (over and over?) on Youtube can be a great way to learn new songs, it certainly is not the only way, nor is it necessarily the most efficient or realistic way to learn them. Suppose that 25% of a congregation can read music, another 25% can figure out what the melody is from the general direction of the notes, and another 25% is good at following the leadership of the ones who can read. That leaves only 25% totally in the dark about a new song, as compared to 100% if the music is not presented at all. Musical literacy matters. Even in a simple congregational setting, providing musical notes along with lyrics can facilitate the learning and singing of new songs. Rather than being a distraction, the notation provides the needed musical mapping to help the singer focus on the meaning of the words, rather than wondering what the next note will be. Is repetition in music interesting and engrossing, or annoying and banal? Some people dislike minimalism (the Terry Riley variety) because it’s too repetitive; others like it because for them it produces a sense of calm and well-being, or some other state of consciousness that they’re seeking. Contemporary worship songs are often criticized for mindless repetition of lyrics and musical content, or defended for being so repetitive, or sometimes compared favorably with the repetition found in some of the Psalms. Excessive repetition of particular musical clichés is one of the marks of amateurish song writing and composition. Masterful use of repetition is one of the marks of great song writing and composition. On the other hand, Schoenberg did not endear himself to the general population by studiously avoiding repetition in his music, but there is something to be said for the creative freedom and “developing variation” for which Schoenberg strove. From a performer’s perspective, understanding repetition in music is one of the keys to gaining a deeper understanding of the essence of the music you are performing. For example, my work at learning a contemporary composition for piano generally goes through several stages: 1) This is incomprehensible nonsense! I have no motivation to keep plowing through this stuff – the music isn’t worth it; 2) Oh, wait! There’s actually some thematic material here that somehow connects to the thematic material there, and it kind of makes sense; 3) I sort of like this part – it’s an interesting development of the main rhythmic motive and melodic progression; 4) This piece is growing on me – I actually like it (after repeated practice sessions)! I believe (but would have a difficult time proving) that the best music contains repetition on multiple levels that is not always obvious on first hearing, or first performing. This can be true of the simplest folk song, or the most complex symphonic score. The most obvious repetitions are the patterns that either attract or repel us initially. In the case of popular music, the songs that disappear from charts quickly are probably the ones that only repeat obvious clichés; songs that remain popular over time probably have repetitions at other levels that aren’t as obvious at first, but which add to the overall interest of the song. To illustrate this idea, here are some observations about repetition in one of the greatest Protestant hymn tunes ever written (if judged by its staying power, universal recognition, or use in other major works such as Mendelssohn’s Reformation Symphony). Martin Luther followed the practice of German Meistersinger and Minnesinger by using Bar form in this hymn tune. The first part of the tune is comprised of a phrase that is repeated (the Aufgesang), and a second (usually longer) phrase not repeated (the Abgesang). Since this is a strophic hymn, the entire hymn tune is repeated with each new stanza. The manuscript above shows two stanzas: two lines of text per stanza in the Aufgesang, and one line of text per stanza in the Abgesang. Within each stanza there are some interesting repetitions. The first (labeled A in red) takes the form of a descent of a fourth from the highest pitch (“F”) to the tenor or dominant pitch (“C”) in the Aufgesang. The second, also in the Aufgesang (labeled B in red), descends from “B♭” to the lower “F.” The Abgesang begins with an ascent from the lower “F” to the dominant “C,” followed by ornamental neighbor tones above and below the dominant “C” and a drop back to the lower “F.” This is followed by a retrograde (backwards) statement of A, an ascent of a fourth from the dominant “C” up to the highest note “F” (labeled A (rev) in red), another repetition of A (labeled in red), and another descent of a fourth from “D” to “A” (labeled C in red). 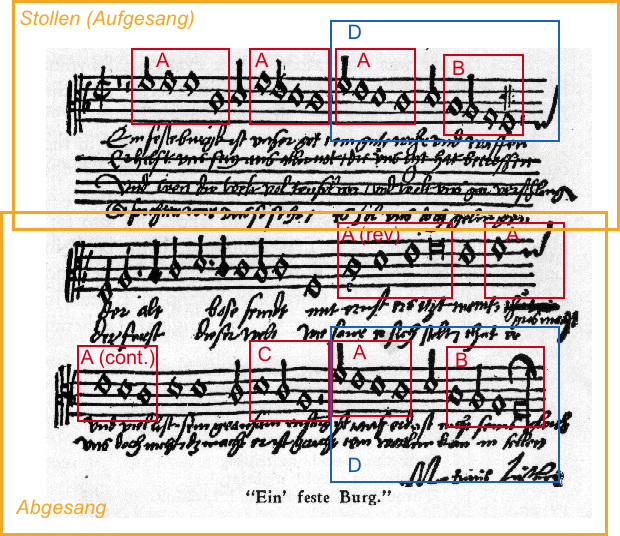 The phrase containing both A and B at the end of the Aufgesang is then repeated at the end of the Abgesang (labeled D in blue). The entire melody for Ein feste Burg is contained within the range of a single octave. The repetitive use of the descending (or sometimes ascending) fourth interval, which subdivides the octave into two parts (essentially the two major tetrachords which form a major scale), paired with the contrasting descent of a fourth from the 6th note of the (modern major) scale to the third note (“D” to “A” – labeled C in red) in the middle of the Abgesang, gives this melody unity without sounding like mindless repetition. Unity is also achieved by using the D unit at the ends of the Aufgesang and Abgesang. Why has Ein feste Burg lasted for so long, and remained singable for almost 500 years? Perhaps there was something of lasting value to the art and craftsmanship of the Meistersinger. Wikipedia article on Bar form. Bach – Cantata BWV 80 – Ein feste Burg ist unser Gott. Luther’s Hymn Melodies: Style and form for a Royal Priesthood, by James L. Brauer. It would be difficult to argue that the backbeat is not a ubiquitous element in contemporary (mostly popular) music, so ubiquitous as to be nearly inaudible. There was a time when jazz musicians like Taj Mahal found it necessary to lecture a white audience on where to put the backbeat when clapping (or, like Harry Connick, Jr., to subtly add one more beat in an improvisation so that the white audience’s strong-beat claps become backbeats). But now, backbeats are everywhere, and form the basic currency for admittance to any serious attempt at music sales. If an audience cannot figure out where to clap, it’s not for lack of exposure. The dominance of the backbeat in contemporary music, across a wide swath of genres and marketing niches, reminds me of sugar for some reason (or boingonium). You have to look long and hard to find any examples of popular contemporary music that do not have the backbeat as a prominent feature. This kind of a challenge makes me think that maybe it would be fun either to find examples of backbeats in non-contemporary popular music from a long, long time ago (or classical music from a century or two in the past), or to find examples of contemporary popular music that do not contain a prominent backbeat. You might call it two sides of a contrarian coin. If you search the internet (YouTube) for performances of the mid-13th century English rota Sumer is icumen in, you might find this: Kalabalik – Sumer is icumen in. Or perhaps you would look for L‘Homme armé, or the Empire Brass recording of Rameau’s Tambourin (18th Century). Of course, I suppose finding the backbeat as part of modern interpretations of old popular tunes and dance pieces isn’t so remarkable. Maybe finding classical pieces that feature “backbeats” as a natural part of the compositional fabric would be a bit more interesting. One of my favorite examples of this is found in the final movement of Beethoven’s Symphony 9 – Allegro assai vivace – Alla Marcia. Classical composers often used syncopation and offbeat accents as a means of heightening tension or increasing musical drama. In the Baroque era, chains of suspensions in a sequence created such an effect; Bach often employed this device in his concertos: Brandenburg Concerto No. 2 (I), Concerto for Two Violins (III), Keyboard Concerto in D minor (I). Chopin often used syncopation and hemiola-like effects (grouping notes rhythmically in a way that contradicts the underlying meter) in his piano music, and a striking example of emphasizing beats two and four is found in his Nocturne in C minor, Op. 48 No. 1. It might be easier to find old music containing some semblance of a backbeat than to find new music without it. But it is possible. Sometimes even contemporary Christian musicians find a way to avoid backbeats (or at least a way to treat them in a subtle, creative way). For example, it’s easy to be drawn to Audrey Assad’s version of How Can I Keep From Singing, even though the backbeat is either absent or incorporated in a very subtle manner (can a real backbeat be subtle?). If “popular” music is to avoid the backbeat, it most likely will not happen in mainstream pop or rock, but in the specialized niches and backwaters of creative jazz or folk / world musicians (“ethnic” music). For example, Brad Mehldau’s treatment of the Beatles’ Blackbird features a bit of a soft backbeat on snare in the middle section, but the subtle use of brushes throughout the arrangement downplays any backbeat emphasis, and yet the arrangement sounds fresh and new, rather than just another “trad-jazz” cover. Snarky Puppy’s Tio Macaco is a contemporary Latin-jazz piece heavy on percussion but almost entirely free of a backbeat (offbeat syncopations, yes; backbeat, no). As the backbeat gained prominence and came to dominate American (and eventually global) popular music, the more subtle rhythmic variations of various folk-culture traditions seem to have faded into the background. That is to say, even if present, the more subtle variants serve as a kind of background to the backbeat. The backbeat is what sells. Why has the backbeat become such a pervasive feature of contemporary music? I dunno . . . I think it’s so ingrained in the psyche of the DIY music-making culture, and the major pop-music factory-studios, that very few people stop to analyze it, let alone attempt to avoid it. No doubt, if you slap that rhythm track on an otherwise mundane, run-of-the-mill arrangement, you can raise its value in the marketplace. Just add sugar (or boingonium). I was guilty of chronological snobbery in High School. My snobbery was not intentional, but practical, an indifference, apathy, and laziness toward history and Latin – those classes were too much work! I can blame the snobbery on my immaturity, and my immaturity on my youth, but it was aided and encouraged by a Zeitgeist that valued “modernity” and “progress” over tradition and classical education. For example, my high school implemented a new open approach to English classes that allowed me to bypass traditional literature courses for film and media studies (this was in the mid-1970s). Only when I was older did I realize how foolish my attitude and choices were. I might still be guilty of chronological snobbery, but I now concede that there are some old ways of doing things which are still valid, and in many ways superior to newer ways of doing things. For example, Bach, Haydn, Mozart, Beethoven, and Brahms all either studied or were influenced by Johann Joseph Fux’s Gradus ad Parnassum, a book with influence that spanned at least two centuries and three major musical stylistic periods. Its influence can still be seen in modern counterpoint texts and courses. Actually, species counterpoint (Fux’s contrapuntal method) is still a thing. Counterpoint and other rule-based, abstract approaches to studying music theory and composition, such as four-part voice-leading exercises, encourage and develop mental and procedural habits that provide a strong basis for evaluating and refining creative musical processes. Unfortunately, modern music technology and a focus on immediate gratification have made it possible to detour around these seemingly mundane and outdated procedures, and with them the mental discipline that results from pursuing them. Certainly this . . .
Fun & Exciting (Beatmaker 3)!!
. . . is more appealing than this . . . In the long run, musicians who work at the latter (counterpoint and similar exercises) are likely to be in a better position to create appealing and enduring music than those who ignore it. This is not to say that studying strict counterpoint is a prerequisite to making appealing music, but the habits of mind that composers of the past cultivated through their study and practice of things like counterpoint produced a “mental infrastructure” that allowed them to create music that, by virtue of its adherence to principles that transcend temporal styles, has endured. Contemporary musicians (or would-be musicians) make a mistake if they assume that there is nothing to learn from the past. I’m often struck by how “stuck” popular music can be in its own idioms (this, for example). The best musicians draw from a well that is both wide and deep. On the other hand, exclusive reliance on printed music can also be a form of “chronological snobbery.” Popular music is often (but not always) created in an aural, improvisatory, and technological context, with less (if any) reliance on notated sheet music. Interestingly, classical musicians and teachers are starting to realize the value of these skills (see here and here for examples). After all, Bach, Mozart, and Beethoven were all gifted improvisers, and C. P. E. Bach devoted an entire section of his Versuch über die wahre Art das Clavier zu spielen (Essay on the true Art of playing Keyboard Instruments) to the art of improvisation and realizing figured bass. The classical emphasis on interpreting and being faithful to the composer’s score has resulted in training and practice that often ignores or minimizes the development of improvisational skills. Yo-Yo Ma, the famous cellist, is among a small but growing group of very famous classical musicians who are leading the way in a new way of making music that incorporates a blend of improvisation, classical sensibility, and popular or folk music traditions. There are also a number of popular and jazz musicians doing the same thing – musicians like Wynton and Branford Marsalis, Sting, The Bad Plus, Bobby McFerrin, Pat Metheny, Brad Mehldau, and Bela Fleck. The purpose of counterpoint, rather than to teach a specific style of composition, is to lead the ear of the serious student of music for the first time into the infinite world of fundamental musical problems. Constantly, at every opportunity, the student’s ear must be alerted to the psychological effects . . . Concerning the second type of “chronological snobbery” (among classical musicians), there are also good reasons for incorporating aural and improvisatory skills in music-making. In any case, creating music in a satisfactory manner requires much work, practice, and study. Amateur musicians and dilettantes might prefer to take a narrow, limited approach which keeps them happy in their world, but those who are responsible for producing music for a larger audience can continually work to broaden and strengthen their experience, knowledge, and skills if they want to produce music of lasting value.